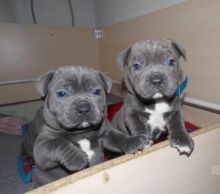 Two Blue cKc Staffy Puppies Now Ready. Health tested for hereditary conditions. Will be fle wormed and 1st injections also microchiped in house . These pups are amazing and need to been seen. Parents are both short n stocky and all round correct dogs . this is my best litter todate.